So far, this has been a whirlwind tour where every stop is different than the last. I must admit that last night when kc and I arrived at our “home,” (kc’s sister was nice enough to give us a roof over our heads,) I was so exhausted that I just went to sleep. So, what was our day like yesterday that I was so tired? The day began with a drive from Calgary to Red Deer on the #2 Highway. To say the drivers on this highway are CRAZY would be an understatement of the extreme. Most of the trip was stormy with hail seen on the side of the road. There were even sightings of tornadoes in the area (of which kc and I were both unaware). The speed limit was 110 kms/hr, and I was driving pretty close to it. Other drivers, even giant semis hauling cement cylinders that could crush two or three cars with a single slip, were doing about 140. My favourite was the guy on the cell phone who, when driving in front of me, insisted on doing 10-20 kms slower than I was going, but, whenever I attempted to pass, sped up to 150. 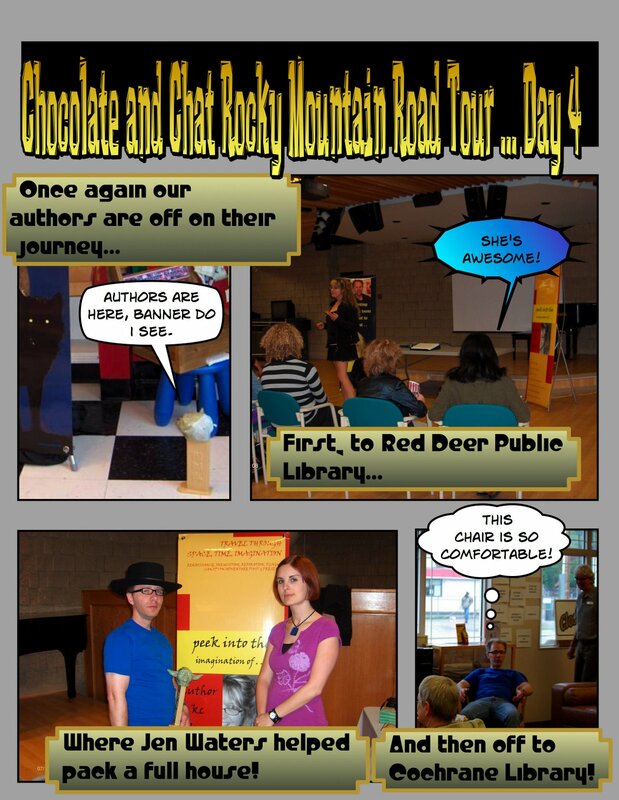 Thankfully, we made it to the Red Deer Public Library alive! Jen Waters was there to greet us, as well as to take us out to lunch with the other children’s librarians. Jen is a very special librarian to me, because she and I met seven years ago while working at Vancouver Kidsbooks. We bonded over the International Film Festival, and have been great friends ever since. To do an event in a library where she works, for me, is a dream come true. To have such a great turnout and see such wonderful enthusiasm with those kids is a testament to Jen’s ability as a librarian to inspire young readers/writers! After Red Deer, we immediately left for Cochrane, where we were to speak at the Nan Booth Memorial Library. We were greeted there by Terrance who runs the events at the library. He had advertised the program well, though we had but a modest turnout. Truthfully, kc and I were beat tired by this point and were grateful for the chance to sit by a fireplace with a few writers and chat about publishing. This group had some great questions, and, as always with these events, I got to learn a little more about kc. We left that library feeling very positive about our Chocolate and Chat Tour! Previous PostChocolate and Chat Day ThreeNext PostChocolate & Chat Tour – Day 6?